the first year as Dr. Martha. We knew... all those years ago, on the banks of the Ohio River...this was going to be someone who contributed to the world. Johnny, her older brother knew that when he said at age 3 ...Now that's what I call stiff competition. Though they have been good for each other and competition has not been between them ever. Here in Oklahoma it will take getting up about 4am or so to see the lunar eclipse. We'll see if that happens... Grin! But in case it is cloudy where you are or you choose to sleep here's a picture. 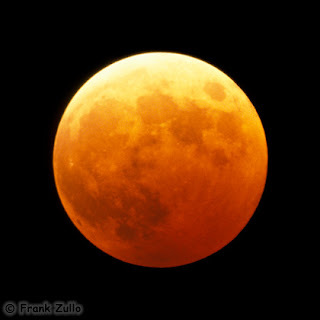 Tonight there will be a full moon, early in the morning, and there will be a lunar eclipse with it. It is an amazing happening. Let's pretend we don't know what it is that is happening. What story would we make up to explain how the moon disappears a little at a time and then returns? Was the moon being eaten? What was happening and could our being concerned make it different? Come back moon! We live in an amazing world. Perhaps even more amazing watching without explanation but with observation. Take a few minutes and look around your world, observing, not thinking it all through. When I taught Biology we taught by a method called the inquiry method. It had come to be a planned way to teach. It was the way my Daddy always taught me. The method was to learn how to frame the questions and then to seek the answers. So you didn't focus on learning the scientific names of the individual trees but you did learn to ask why those trees had leaves that seemed to turn backwards before a rain. Framing the questions in our lives is an important tool for each of us. And now each of us is learning more and more how to Live-Into the answers. We seek some days to have our lives illuminated. We want to have things so that we can see them and then cope with them. But I have always thought there is more to our world than things we see. We have heard it said, "Thoughts are things" . We can convince ourselves in positive or negative ways. We can do the same to others. We can uplift the world with thoughts of peace and peacemaking where we are or we can sew seeds of chaos and hatred. Choose life as the Old Testament tells us. This day choose life and goodness for the world. This is the time to be wrapping the world in peace. It can surprise all the war-makers. It is something I see... not night vision...perhaps faithful right vision. It is Saturday early evening here and a thunderstorm is outside. My daughter's dog ChiliPepper is smushed in the chair next to me with her head buried. Even blind she doesn't like the sound of thunder. She is so cute. The TV Satellite isn't working because of the storm's thickness. It is quiet. I stumbled on the site that had the above quote on it. I paused as I read. What have we to learn, to affirm what we believe, in the thoughts of others. We live our lives seeking hope and happiness and all good things. Look how this quote inspires us to do so...to share as well as live into happiness. To decide that we will live our lives in the sure and certain knowledge of God's love for us. It seems like we often choose otherwise. To live our lives wondering when the good time will come. Now.. it is here now. So, as you move through your day, enjoy your day. Find ways to celebrate and stay thanks for this day and the opportunity to be about sharing that happiness with others. "Happiness runs in a circular motion.."
Have you ever heard something that sounded good to you and then..whoosh you are living that? Yesterday's scripture began... Be not afraid, little flock...and I got to apply that during a rather hectic and confusing day. Which is turning out ok now. What was the lesson that I confronted? No matter what, God is good, all the time. Of course there are moments, days perhaps, where it seems that saying must certainly apply to someone else...not me! Surely not for me? Not now in the midst of things that seem so out of one's control. But wait... why would only good things be in God's control. Wait wait, don't misunderstand me, why do we not count God in on the hard times as well as the good times. Because I believe that GOD-god abides. That in the Good times and the "other" times God is with us...and saying to us, "Be not afraid. It is God's good pleasure to give you the kingdom." It's the same thing that God wants for each of us. Driving home from Frederick I noticed the Oklahoma wind was blowing again. I noticed it because of the way the trees were yeilding to the passing of the wind. I wondered. Where does the wind begin? There must be a point where the wind is ahead of everything else. No wind/wind. What was the leading edge of the wind. Have you ever seen it? Have you ever been standing somewhere and the wind came sweeping down? "Wind is caused by air flowing from high pressure to low pressure. It's direction is influenced by the earth's rotation." When my dear Uncle Beenie, (Marion) died in July we were gathered a the gravesite in Tuscaloosa, Alabama. It was very hot and very humid and the air seemed completely still. The minister was speaking and under the tent all of us were so very hot and I worried about my Aunt Gene and my Mom and Aunt Kat and Aunt Dot with the air so still and hot. Then, from somewhere a cool breeze came swooping through the tent. Ah. It was amazing. We were cooled down so perfectly. We are going to be ok. In just a few seconds a second swoop of wind came through. I thought, "Thank you Uncle Beenie, we needed that!" I looked to my cousins, his kids, who looked at each other smiling and said to one another..Daddy... They thought it too. It was a gift from heaven twice given. That was the wind's beginning. Imagine the winds first over the earth. The Spirit of God that swept down across the earth. That Spirit that still sweeps and bring energy and life. That breath of God that swept over the waters. Proverbs 1:6 The wind goeth toward the south, and turneth about unto the north; it whirleth about continually, and the wind returneth again according to his circuits. Where does it begin? Watch for it. Be ready when you are outside to feel it start...just that moment...like the first breath of a newborn child. I was listening to a radio program about the Lincoln Highway which was the first road that went from NYC to California. My Grandfather Edward Giltz lived on the Highway in Massillon Ohio. Their house was a magical place to me. He was a 'keeper' from the Depression time and you wouldn't get rid of something good because someone might need it sometime. The house was always an interesting configuration to me. I finally found out after many years that Grandpa built it but then for some reason they had to turn it... so that what had been the front looked out onto the garden and the neighbor's house. The front room was small and they had added a door and porch. It finally made sense. What do we do with memories of such places. I have pictures here or there with my Grandfather, (my Grandmother died when I was 4 and I have only small memories of her) and his garden. He had some beautiful plants, always an amarillis or two, and other really beautiful plants. He also had some grapes that were delicious. At night sleeping in my Dad's old room the trucks would come down the hill the house was on and shift down, grinding, and sometimes almost shaking the house. I remember it as wonderful. My mother said it kept her awake every night. My Dad's room had an old beautiful sleigh bed and one of those antique bookcase with shelves, a desk and it was wonderful. I miss that still. The Lincoln Highway memories bind me to my family, now all gone. But in my memory they abide.